[Whites as a race, are much more disciplined for example than blacks. Only the Asians match, or, in the case of the Japanese, exceed us in discipline. Apart from the Japanese, we are the best when it comes to a natural discipline in our race. 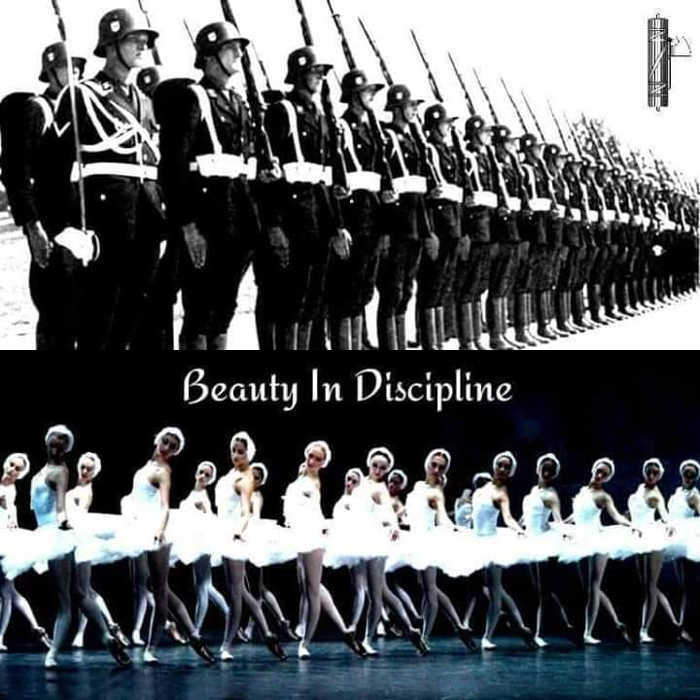 I spotted this beautiful meme called “Beauty in Discipline”. But our values go deeper than just beauty. Our values are: highly functional, and more efficient. We have learned these things, often from warfare and battle. Our discipline brings us back to Teamwork and the Jews and Liberal is using fake FREEDOMS to lure us away from our natural teamwork and the success that comes from that. They call our Teamwork “racism”. Don’t listen to them. Stick to the things that have worked for us for tens of thousands of years and which have enabled us to conquer and dominate almost everywhere we have gone.